In the middle of a downpour, officials partake in a groundbreaking for the new arena at Bass Park in Bangor on Thursday, August 4, 2011. The arena is scheduled for completion in 2013. Bass Park executive director Mike Dyer addresses the crowd gathered for the groundbreaking of the new arena in Bangor on Thursday, August 4, 2011. The project is slated for completion in 2013. 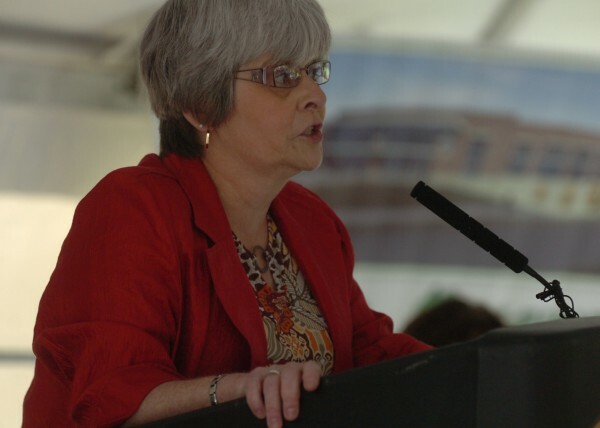 Bangor Council Chairwoman Susan Hawes addresses the audience gathered for the groundbreaking ceremony of the new arena in Bangor on Thursday, August 4, 2011. The expected completion date for the long-awaited arena is 2013. 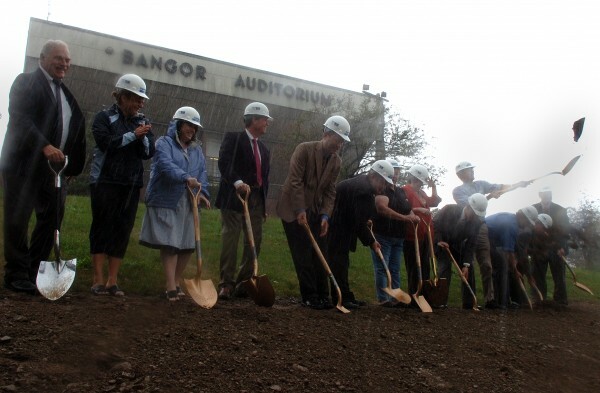 BANGOR, Maine — Fifty-seven years and 98 days later, the same ceremonial shovel used to officially break ground for construction of the Bangor Auditorium was plunged into the earth again at Bass Park. A steady rain that turned into a downpour forced about 100 people attending Thursday morning’s ceremonial groundbreaking for the new arena and convention center to huddle under a tent. Although the downpour came just as city councilors and dignitaries grabbed the 11 ceremonial shovels to dig up the approximate location above which the administrative offices for the new arena will be located, it wasn’t enough to dampen the enthusiasm or mood of the event. “Well, many people probably say the City Council is all wet anyway, so what the heck,” Bangor City Council Chairwoman Susan Hawes joked just before grabbing a shovel and braving the soaking rain. John Bragg, president of Bangor-based industrial supply company N.H. Bragg, brought the chrome-plated shovel that was used to break ground for the Bangor Auditorium on April 28, 1954, as well as for Bangor High School, the Penobscot County Jail, the New England School of Communications and other Bangor-area facilities and buildings. Thursday’s ceremony had even more significance for the Bragg family business. Bragg recalled watching everything from Boston Celtics games to the Ice Capades at the auditorium as a child. Many attendees at Thursday’s event had historic connections with the auditorium, which loomed in the background on the hill, below which was the site of the ceremonial dig. Former Bass Park director and Bangor Parks and Recreation director Thaxter Trafton was at the ceremony. Trafton, who was commissioner of the Department of Economic and Community Development under former Gov. John Baldacci, said the eventual demolition of the auditorium won’t be a bittersweet thing for him. Trafton wasn’t alone in his sentiment. “Everybody’s excited about moving forward on this. 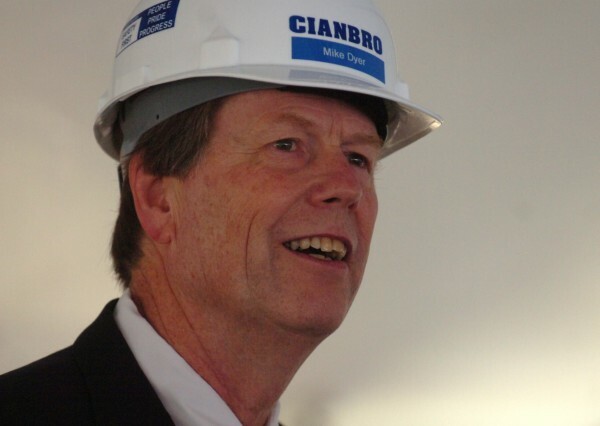 There’s been a lot of preparation for this day, going back a number of years,” said Peter Vigue, chairman of Cianbro Corp., which was awarded the contract to build the new arena and events center. On Monday, the Bangor City Council approved a guaranteed maximum price for construction of the arena — and demolition of the auditorium — of $58,594,619. It now is awaiting a guaranteed maximum price for architectural services. “Then we’ll have the total cost, which will be close to an initial estimate of $65 million. It may be a little more, it may be a little less,” said Bangor City Manager Cathy Conlow. The new arena is expected to have seating capacities of 5,800 fixed and 8,050 standing and seated and is scheduled to open by Labor Day 2013.